The world didn’t end on December 21, 2012, although we had so much rain during the night that I occasionally worried we were done for. 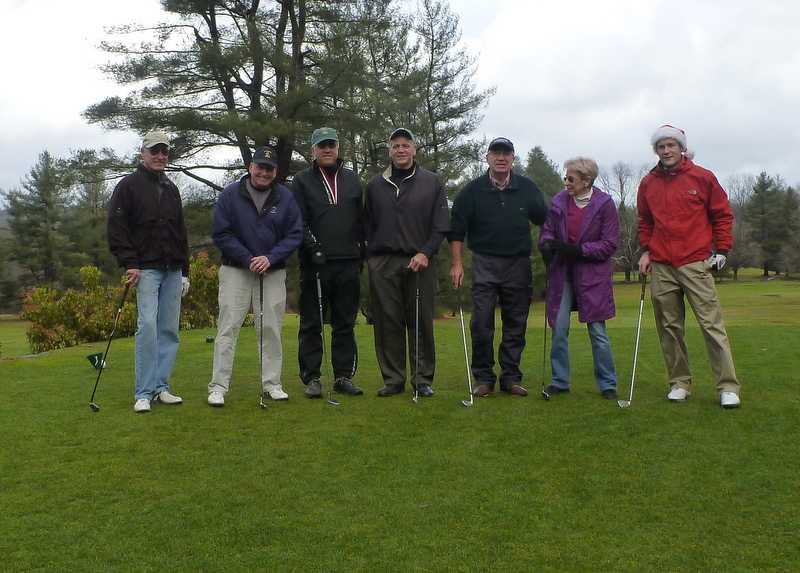 The storm continued through most of the morning, and, as a consequence, just three of us showed up at 10:00 for the Sunday Morning Group’s second annual Winter Solstice Scramble and Holiday Party, With Gift Exchange. 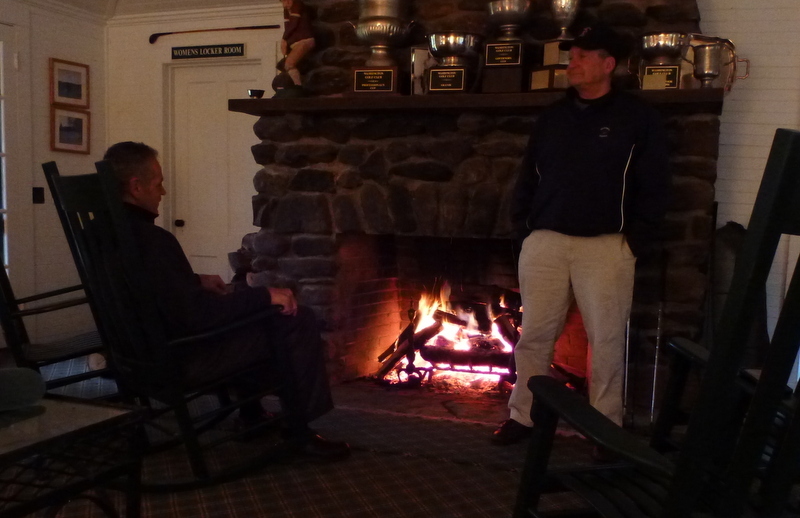 Gary, our superintendent, built a fire in the clubhouse fireplace, and he, Hacker (real name), and I sat in front of it and used our cell phones to send sarcastic emails to everyone else. Gary and Hacker: where are Doug and Mrs. Doug, among other people? The rain slackened after about an hour, and we could tell from Raindar that it was going to end soon. By 11:30, we had seven participants, including Mrs. Hacker, who had been delayed by a fallen tree. During the one-club, we saw six deer on the ninth fairway (photo below). 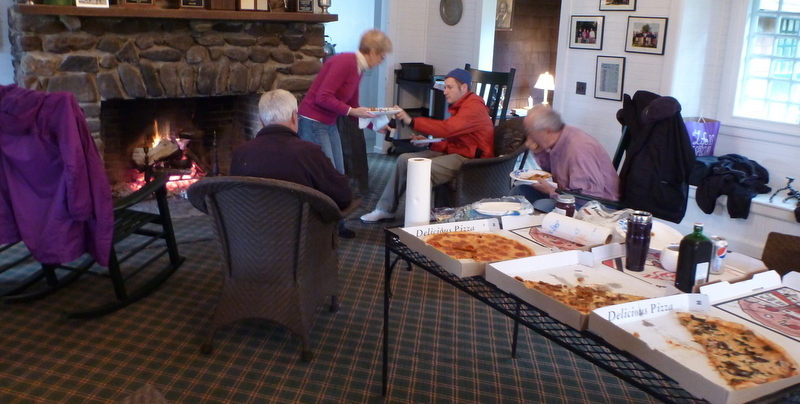 When the pizzas arrived, we paid for them out of the Sunday Morning Group’s Slush Fund, which Hacker keeps in an envelope. The pizza was terrific, as it always is, and during the gift exchange I received, from Hacker, a coffee cup that looks like a softball-size golf ball. He hadn’t bought it—he had just found it on a shelf—but I still like it. You can see part of it in the bottom right hand corner of the photo below, between my Thermos brand coffee travel mug and the communal bottle of Jägermeister, the official cold-weather intoxicant of the Sunday Morning Group. I poured my Diet Pepsi into it, as a gesture of gratitude and respect. Here’s one of the places where the heron had been fishing. 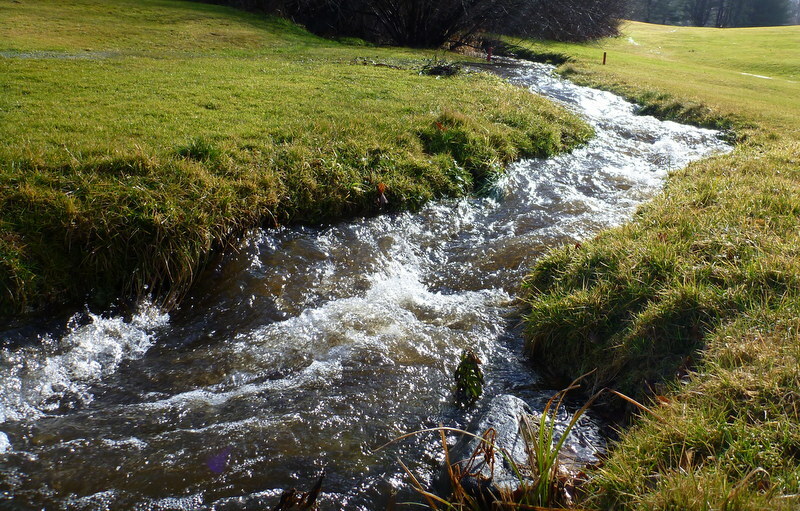 Ordinarily, this stream is about a foot wide. We discussed holding a contest to name the heron. One possibility: “Uncle Frank,” after our dearly departed old friend Uncle Frank. It’s remotely conceivable that the heron actually is Uncle Frank, in bird form, although it doesn’t smoke or tell funny stories, and it doesn’t appear to be married to a retired soap-opera star. 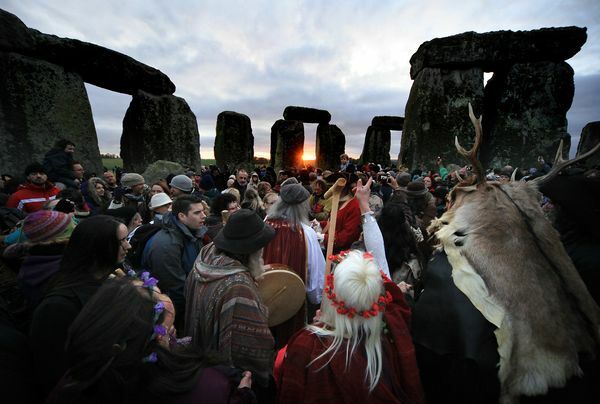 We didn’t have as big a turnout for the 2012 Winter Solstice as we did for either the 2011 Winter Solstice (see photo immediately below) or the 2012 Summer Solstice (see photo below that). But seven is still pretty good for a day when nobody in their right mind played golf. Winter Solstice tournament field December, 2011. 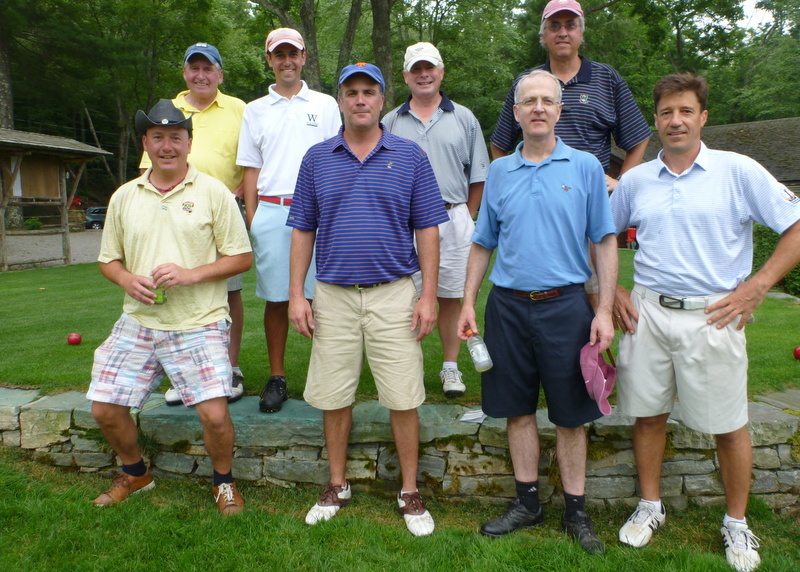 Summer Solstice all-day golf event, 101 holes, June, 2012. This entry was posted in England, Golf Courses, Hacker (real name), Sunday Morning Group, Weather and tagged end of the world, Jagermeister, Raindar, Stonehenge, Summer Solstice, Winter Solstice by David Owen. Bookmark the permalink.